When it comes to new-wave, one band towers over the rest of the field. With a sound that's synonymous with great '80s pop and arena-sized hooks, the Cars became a veritable greatest hits factory. Half-speed mastered from the original analog tapes for the first time in history, Mobile Fidelity's numbered, limited-edition 180-gram vinyl LPs of the Boston quintet's blockbuster 1978 debut The Cars (on which ever song is a radio classic) and smash 1979 follow-up Candy-O sound sensational. Let the good times roll! One of the most successful and enjoyable debuts in history, the Cars' self-titled album doubles as a greatest-hits collection. A primary reason why the Boston quintet became America's most popular new-wave band, The Cars launched multiple tunes still heard on radio stations everywhere: "You're All I've Got Tonight," "Good Times Roll," "Just What I Needed," "Moving In Stereo," "My Best Friend's Girl." Customer Reviews (4.11 Stars) 9 person(s) rated this product. I recieved this Cars LP as an early Christmas gift from my wife who lovingly supports my vinyl obsession. This remastering job is really oustanding given this master tape is now around thirty plus years old. I will say that MoFi missed a couple of moments of opportunity to accent the crescendos in "All Mixed Up". Just a little too laid back in the slam of the drum and high-hat for my taste. That song is designed for major impact in those moments and it didn't come through on this mix. Same for the snare rolls on "You're All I've Got Tonight". Again the mix was a little slight in the punch of the bass and crisp roll of the snare drum. Those two critiques not withstanding, this mastering is far better than the original I have and is also much more detailed and has a deeper sound stage than the HDCD I own. Big thumbs up to MoFi for this job. I will agree with another reviewer concerning noise floor. Could be a lot more black and quiet. A liitle QC goes a long way. I remember MoFi's 70s and 80s pressings: ridiculously boosted top end and blurry bass. However, you could always count on quiet vinyl (JVC pressed). At best the mastering was hit-and-miss, but the background was silent as the grave. ........FANTASTIC mastering! Great sound, on par with the original Elektra pressing I own (went through a lot to find a great one). In the background however......POP, CRACK, SNAP, POP (repeat often). I cleaned it again, and achieved the same result: Ocasek and crew LIVE in my living room, playing in front of a cozy campfire. If only MoFi could combine today's mastering with yesterday's quality control. Had to stop and sit down. Some of the real audiophiles will scoff, but sometimes I put albums on while I'm doing other things. This LP sounded so perfect that I had to sit down in the 'optimum seat' and just listen through, making mental notes of what other albums I would LOVE to see given the care that this one received. Top notch. Apart from sounding a bit bright, I definitely prefer this copy to my dad's original Elektra pressing. One of the very best records from the 1970's and MFSL has done a great job of giving us one more chance to get this classic on vinyl. This pressing may be a tad too reserved in some areas but overall it's a great sounding record and sorely needed since my original from 1978 is getting more than a little threadbare. Highly recommended and don't wait forever; the cost will only go up! MFSL is on top of their game! 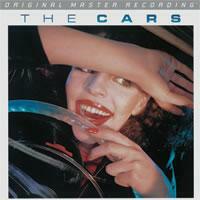 The Cars self titled lp is perfect in every way. It sounds as as good as it looks. An undeniable demo disc.